Anybody who has suffered with lower back pain will not be surprised to learn that this complaint is the second most commonly experienced complaint after a headache. Everybody, from young athletes to the elderly and retired, will experience a form of lumbago at some point in their lives. The problem is that despite this prevalence, many people will not fully appreciate the complexity of this ailment and the opportunities on offer. Here is a brief introduction to the definitions, causes and treatment options of lower back pain. Lower back pain sounds like a rather vague concept compared to some other illnesses and that is because it covers so many different symptoms and problems over a fairly complex area of the body. The lower back is defined as being the section between the upper body, which ends at the ribs, and the lower body – the legs. As a load bearing area, which contains the spine and many vital nerves and muscles, this lower region is prone to injury in many forms and there is a large number of specific afflictions within the wider banner of lumbago such as Sciatica and Coccydynia. Unfortunately this means that exact illnesses can be difficult to diagnose and treat and this can lead to the more serious issue of chronic lower back pain. We have all experienced lower back pain in some form or other, whether it is slight twinge or spasm, but what criteria are required for this pain to be considered as chronic? Patients that experience severe back pain for a short period of time, typically less than a month, are diagnosed with acute lumbago. On the other end of the scale, the chronic form of this condition is generally diagnosed if the sufferer has been experiencing pain for longer than three months and if this pain is the result of prior injuries and complaints. Some professionals feel that chronic back pain of this nature is the result of over-sensitised nerve endings in the spine but some also suggest that it is more likely to develop in patients that do not take effective action from the outset or that have anxiety or depression. Causes Of Lower Back Pain. 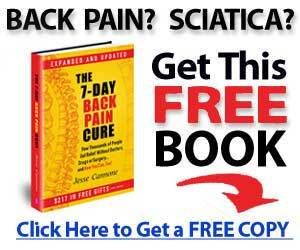 Because of the complexity of this area of the body and the issue of chronic lower back pain, there are many different causes of this ailment that could be contributing to your specific condition. These causes range in severity from simple tears and muscular issues to spinal conditions, nerve problems and other serious illnesses. Because of the vital function of this part of the body it is all too easy to pull a muscle or tear a ligament and suffer a minor form of acute back pain. The discs in the spinal column are another major source of injury and illness, for example degeneration with age, inflammation and herniation, but lower back pain can also be the result of a compression fracture or nerve damage, such as compression of the sciatic nerve. These causes are considered as being some of the more common causes of lumbago but there are other, rarer possibilities such a blood infection, ankylosing spondylitis, fibromyalgia or even a spinal tumour. The treatment of lumbago can be managed through a range of different options and the first area to consider is the basic form of relief that can be enjoyed on a daily basis within the comfort of your own home. Measures such as simple movements, ice packs and changing your posture with equipment like an ergonomic chair can be enough for some light relief but there are other options that you can try including supplementation with vitamin D and magnesium, specialised analgesic creams and other alternative therapies. If you have the time and commitment to invest in lower back pain relief without drugs then you can try some relaxing yoga poses, a therapeutic massage, a session with a chiropractor or some acupuncture. If, however, you would prefer allopathic treatments there are medications available. There are many, varied forms of drugs that are recommended for treating lower back pain; some are prescribed, some are over-the-counter and they all dependent on the cause. There are strong narcotics that can be prescribed to people with chronic and particularly severe conditions but if you are suffering with a more mild and short-lived complaint than a basic non-inflammatory such as ibuprofen or aspirin could be equally effective. If the problem manifests itself through spasms then a simple muscle relaxant may help and if the condition is related to stress or depression then a simple dose of an antidepressant such as amitriptyline could be beneficial. These are the more common forms of medication but there are also claims that steroids, anticonvulsants and even botox could also be effective, although further testing is needed before they are substantiated. Many people would probably prefer the idea of taking a few pills for some quick pain relief over this next treatment option but exercise is another highly recommended course of action for many forms of lower back pain. This will be bad news to sufferers that prefer not to move at all during a bad attack or spasm but, as long as you are not suffering from acute pain, simple exercises can be worthwhile. As is seen in the use of yoga for relief, gradual stretching can keep the muscles active and improve posture in a simple way as long as you use the correct methods and poses. Other beneficial forms of exercise for lumbago are core strength activities, such as sit-ups and crunches, dynamic stabilization on exercise balls, lumbar traction and hydrotherapy. As you can see, the subject of lower back pain is diverse and complicated because it is not as simple as an occasional muscular spasm; there are many different causes and symptoms of lumbago – more than can be discussed in this simple introduction – and many forms of treatment and relief. Once you understand the cause of your specific problem you can work towards an effective treatment option and ensure that the problem does not become chronic.